Oxidation… the villain of every winemaker. Any air found in the head spaces of containers used in the aging process can destroy a wine’s character in a non-recoverable way. Stainless steel impervious structure allows for exacting control of the wines exposure to oxygen. Should there be a need for oxygen, it can be introduced through modern micro-oxygenation techniques. Improperly stored wine, in oak barrels during the aging process, can lose over 14% volume in three years due to evaporation. For this reason, it is best to adopt processing techniques which will prevent evaporation. Wine aged or stored in stainless steel wine barrels does not lose water and alcohol to evaporation. 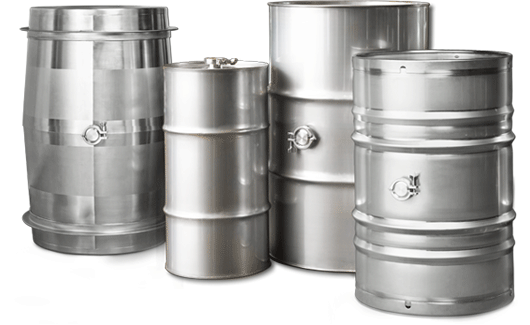 The impermeable nature of stainless steel eliminates the need for topping operations no matter which stainless steel barrel design or capacity option you choose. That makes stainless steel wine barrels an ideal holding container of wine for “topping off” wine being aged in oak barrels. Choose from any of our stainless steel wine barrel designs.